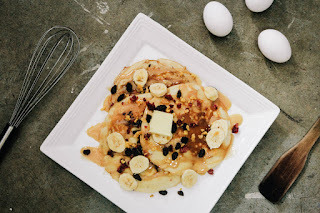 6 Life Lessons From My Pancake Fails! While it doesn't particularly look this cool, attractive and oh so mouth watering,(Couldn't get a decent photo of mine) I can boldly say you wouldn't discard my recent pancakes either because of its looks or its taste. Yes! My pancake game has gotten stronger like I already said in this post. It's much of a big deal for me because of reasons I can't even explain. I'm just really excited that there's no such thing as flour, eggs, milk, sugar wastage anymore when it's time to make pancakes. In previous times, it's either I get a really awkward shape or it feels sort of rubbery and I'm all for the right/perfect shape and feel. Luckily for me, it always had a great taste but you wouldn't want to eat what doesn't look attractive now would you? I was just musing over what and what I had been doing wrong when I realised there were amazing intertwined life lessons there and I thought to share it here as I already mentioned in my September Recap that I would. 1. Sometimes it's the foundation that has been destroyed : I used to think the problem was with the frying pan I was using not knowing that everything that was wrong was with the foundation; The Batter! It was always a tad too watery. So maybe that final year course is quite simple and isn't as hard as you make it seem but you just didn't pay attention to the basics in your first year? "If the foundation be destroyed, what can the righteous do?" 2. Don't play the blame game : Objects, people, circumstances. Stop blaming! I write this with so much guilt and I dedicate this to every frying pan I used in my pancake journey. I always transferred my anger to them. It's either it was too big or too small or it naturally gets things burnt easily. Plus I was told non-sticky frying pan is the best. I didn't have that so I was always quick to say 'It's because it's a normal frying pan not a non-sticky one'. Stop the blame game and be responsible for your actions. 3. Sometimes all you need is something extra : Or a little more energy. On the foundation being destroyed, remember I said it was always a tad too watery? What if I had added a little more flour? It would have probably come out well. Maybe all that the project you've been working on for a long time needs is a little more push? Maybe all you need to pass that course is that topic you feel is quite irrelevant? 4. Don't be satisfied with the status quo : Looking back at it now, I realise that I never changed anything about my recipe. I always made it the same way. Why? Because I was convinced the problem was with my fry pan and not me. I was very consistent with my watery batter which explains why I kept getting the same result! Maybe you need to look at that particular challenge from a whole new perspective? 6. Practice makes perfect : At the risk of sounding cliché, I had to include this. If I had let all the 'wogly' pancakes get to me and finally quit, I'd never have written this post. I kept on at it and finally discovered what works for me. In life, trials and errors are allowed! A man who has committed a mistake and doesn't correct it is just committing another mistake. Any more lessons you think I missed? Huge fan of pancakes or not? How did you learn how to make pancakes? Did you get it perfectly the first time you tried? Any pancake hacks for us? What's your favourite thing about pancakes? Leave me your thoughts and let's discuss! I can't believe October is gradually coming to an end. The future is now, guys. Don't put off living to next week, next month, next year or next decade. The only time you're ever living is in this moment. Have an amazing week! I'm one that looks to experiment with food and try out new scopes and recipes, so I sure as hell agree with you there. But overtime, I got better thankfully. Hahahahah. I still battle with the flip sometimes, or the perfect round shape. But then there are small pans for that so it helps! I love pancakes kinda, but fitfam won't let us be great. Kachee, have you tried banana pancakes made with just bananas and eggs? It's fitfam friendly! I'm with Ada on this one. I have not tasted pancake before. These lessons are the truth. I should try pan cake making, I doubt if I'd like it though. Yeah, ''don't be satisfied with the status quo'', is a lesson for everyone including me. It doesn't make one see other opportunities available but rather limits you to a boundary. Lol! Blaming the frying pan was something I actually did when learning how to make pancakes. Its amazing how we can draw a lot of lessons from the most random things. Thanks for sharing this Ola. Interesting post, dear. It's so easy to play the blame game right? Once you get the batter right, every other thing should fall in place. Still with the right batter, sometimes your first pancakes might be awkward because they "season" the frying pan. I have a couple of fool-proof pancake recipes on my blog that can be found by using the search button. That last statement on the post is everything. The time is now! I really love the creativity in this post, from pancakes we're going into life lessons. Welldone love. One time I added too much nutmeg and it ended up as a disaster but I still ate it like that Abi who will help me? 😆 like you said practice makes perfect so I just keep trying. Lovely write up hun, even in life, we need to keep trying before we get it or perfect it, so weldone on your pancake adventure ..Lol, oh yes I love me some pancake and my mum is a food and nutritionist, you best pancake and other yummy snacks is always readily available for anyone, but now I just had to slow down on carbs, healthy eating has taken over...Lol..Weldone babe. Am amazed on how you coined some life lessons outta of this. Fortunately for me, i started making pancakes wayyy back honestly can't remember any that didn't come out well. Love them too. I love how this post transcends beyond the art of making pancakes. I love the lessons and yeah I remember I used to play the blame game for a long time in my life. Thanks for sharing dear, loved every sec I spent reading this. I made pancakes last night and I still blamed the baking powder for being fake coz it was fluffy and think like it is on Tv. But now I know the foundation was the problem. Great post, I love how creative and in-depth you always are! *it wasn't fluffy like it is not Tv.